You can buy pre made gyoza skins in Chinese or Asian supermarkets which would make the whole process below a bit less fiddly/time consuming (I will be doing this next time!). However if, like me, you didn’t have time to get your hands on any, you can always whip them up yourself! With minimal ingredients the skins are relatively simple to make and the best thing is, you can stuff them with whatever you fancy! Here I’ve gone for a classic mix of pork and prawn which turned out to be absolutely delicious. 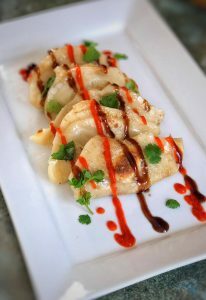 At only 6sp for a portion of 5 gyoza, you can have a little bit of what you fancy for not very many points at all! 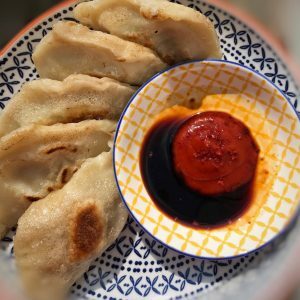 The method below tells you how to make the gyoza without any pre prepped ingredients or special equipment however one thing I would recommend are these fab little gyoza makers. They are so cheap on eBay and make the whole process so much quicker and easier – they really make sure the edges of the gyoza are sealed tightly! The little delights can either be served as a starter or can be served as part of a gyoza noodle soup (recipe for this bad boy also coming soon!!). Sieve the flour into a large bowl. Add the salt to the water and stir to dissolve and then gradually add the water to the flour, stirring to combine. Once combined, form the dough into a ball and then knead for around 8 minutes. Cut the ball of dough in half and then, using your hands, shape each half into a chunky sausage shape. Wrap each sausage separately in cling film and then pop in the fridge for 30 minutes. While the dough is resting you can make your filling. It couldn’t be easier, pop all of the filling ingredients into a food processor and blitz until you have a sausage meat like texture. Season with a little salt and black pepper. Pop in the fridge while you finish the wrappers. Note: if you have pre made skins, you have the advantage of starting here and then skipping to step 5. Take the dough out the fridge, dust the bench with a little flour and then cut each sausage into 12 (cut in half and then each half into six). Cover the dough pieces with a damp towel to stop them drying out and then, taking each piece in turn, roll into a ball with your hands and flatten by pressing with your palms. Roll out until flat and thin and then, using a round cutter (or glass), cut into rounds (you want them to be roughly the size of your palm). Collect the excess dough from the outside of the cutter as you go and combine (this will make your 25th gyoza!). Pile the skins on a plate and top each with a little flour to stop them sticking together. Now get ready to assemble the gyoza. Pop the bowl of filling next to the plate of skins. Have a small dish of water ready. Take one skin in the palm of your hand and pop a teaspoon of the mixture in the centre. Dip your finger in the water and wipe around the edge of the skin (this will help the edges to stick together). Bring the edges of the skin together than then pinch ‘pleats’ along one side, pressing each pleat into the opposite side of the skin. This should seal the parcel completely. At this point, you can pop all the gyoza you aren’t eating onto a plate in a single layer and pop in the freezer for 1 hour. Then remove and bag up into separate portions and pop back in the freezer. For the gyoza you are cooking right now, there are two ways you can go about it. The first is to boil the gyoza for 4-5 minutes until cooked through. The second is to spray a frying pan with 1kal and in batches, fry one side of the dumpling for a few minutes until golden. 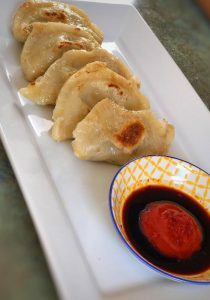 Once all of the gyoza are browned, add them all back to the pan, add ½ cm water to cover the base of the pan and cover with a layer of tin foil with a few holes poked in. Steam on a medium heat for 5 minutes until the filling is cooked through. Serve with a small bowl of dark soy sauce and a small bowl of sriricha for dipping. Love the sound of this recipe! 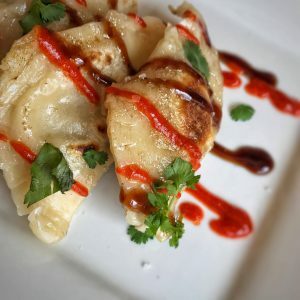 What is the SP value for the gyoza dough before a filling is added? Just so I know if I used a different filling that is lower in points, thanks! Oh wow, I LOVE gyoza! These look amazing for such low points, thank you for posting!